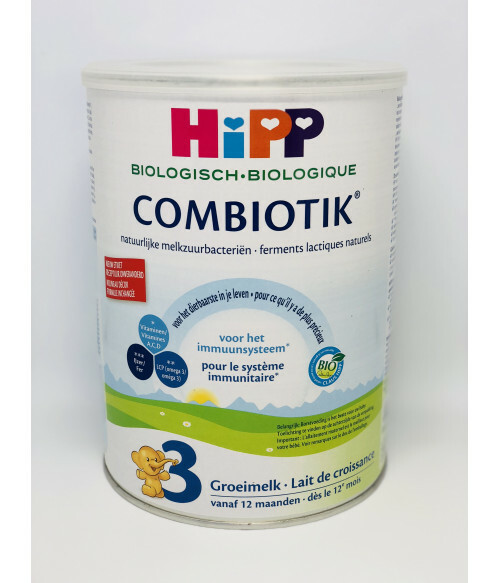 HiPP Bio Combiotic stage 3 Dutch version is a nutritionally complete, whey based, gentle infant formula that is specially formulated using the finest organic milk. This formula is suitable from 12 months onwards for babies that are not being breastfed or to complement breastfeeding. It only contains lactose as its only carbohydrate and contains natural lactic acid cultures that are similar to breast milk. It has all the ingredients your baby needs to grow strong and healthy such as, iron, Vitamins A, C, and D. Vitamin D is essential for calcium absorption and bone growth and omega 3 (ALA), which is found in breast milk, helps babies with brain and eye development. It also contains prebiotic fibers, which are modeled in breast milk, that are derived from lactose and support the healthy intestinal flora. HiPP Bio Combiotic stage 3 Dutch version does not contain any gluten or starch, allowing for easier digestion in the early stages of development. HiPP understands the many different needs of babies and has something for every child. My experience with this company has been flawless. Sergei is prompt and has great communication and follow up whenever there has been the need. It's has been such a relief to finally find a company that has their act together in managing their product and process. I've had some nightmare experiences with other companies and getting the Hipp formula we use. If you've ever had a child on a special formula that you just cant drive to the store and get you can understand the anxiety in dealing with companies that have let you down. I wont need this formula much longer but will be looking at their other products to try and continue giving them my business. This company is a dream to work with and the absolute best one I've dealt with to get Hipp combiotic formula from. Over this last year I've placed 5/6 orders of 6 cans each. They always arrive as ordered within the delivery time. I love how they now offer overnight on a whole case rather than just 1 can. I'm one of those busy peoples who occasionally get dangerously low before I remember to order and then dont want to have to manage and keep up with split orders. My past experience with OTHER companys for instance who order from Europe and have them send it to you and it gets stuck in customs for weeks, or those that send you whatever they want and then go silent and I have to recoup my $$ from my CC co almost made me give up on this formula. I will forever be a loyal customer and am looking at what else I can buy through them. I have used this company several times for formula, and this last order will be the last. In previous orders I have reciveved an occasional dented tin (as other reviewers have noticed), and occasionally odd packaging (in old other formula boxes) but I did not mind this - I even left a positive review in the HiPP State 2. With the last order, I ordered 6 tins, and recieved only 5. Four were in a priority mailer box, and the 5th was in a white bubble mailer with the tin inside protected with cardboard. When I reached out for resolution , was told that I was wrong, they had shipped 2 tins in the second shipment, and that it was in also in a priority box. Since I had not photographed the evidence of the bubble mailer, they refused to resolve. I won't be using their services again, and if you choose to, just make sure you recieve what you pay for .